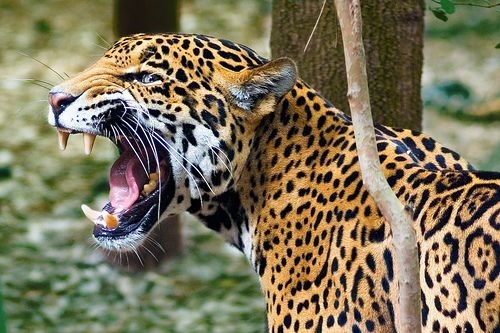 Animal Wildlife | Jaguar | The jaguar is the largest feline on the American continent, with jaguars also being the third biggest cat in the world behind the African lion and the Asian tiger. 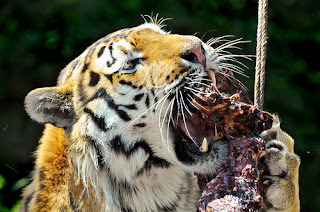 Jaguars have the strongest bite force of all the cats and like other pantherines they can roar. The jaguar is indigenous to the Western Hemisphere. Jaguars inhabit the tropical rainforest's of South America with the elusive jaguar spending a great deal of its time asleep in the trees or hunting in dense undergrowth. However, due to the habitat loss within this jaguar kingdom, the jaguar population numbers are declining making jaguars an endangered species. Jaguars have a similar rosetting pattern to a leopard, but the jaguar has a much heavier and sturdier build. Jaguars hold the reputation for being very aggressive, though attacks on humans have historically been rare. Undoubtedly a strikingly beautiful animal, the jaguar has caught the attention of scientists and hunters alike, with many jaguar individuals having been poached for their distinctively patterned fur. Black jaguars occur from time to time. In jaguars the black colouration is a simple dominant gene. 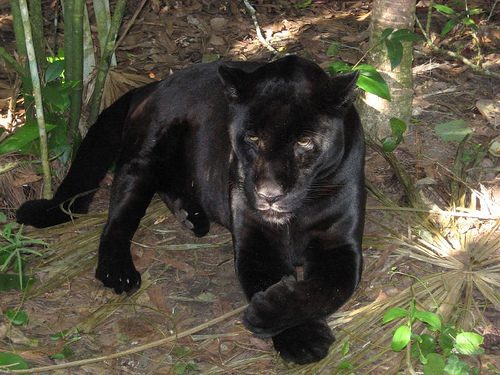 Two black jaguars can produce a lighter spotted cub in a litter of blacks. As with black leopards, you can see the spotting as black on black in strong sunlight. Jaguars tend to prefer thick, dense, moist jungle where the jaguar has plenty of cover in order to successfully hunt and the ambush prey. Although this is the case, jaguars appear to be fairly adaptable animals and jaguars have been known to reside in reed thickets, shrub land and swamps. A jaguar was found in the desert region of southern Arizona a couple of years ago. The highest concentration of jaguars is today found around the Amazon Basin, where there is plenty of food, water and shelter for the jaguar to live undisturbed. Jaguars are nearly always found in close proximity of water such as lakes and rivers and jaguars are very rarely found in arid, more desert-like areas. 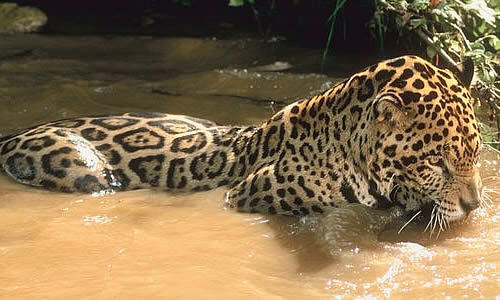 The jaguar is an excellent swimmer and the jaguar can move through the water at surprising speed. 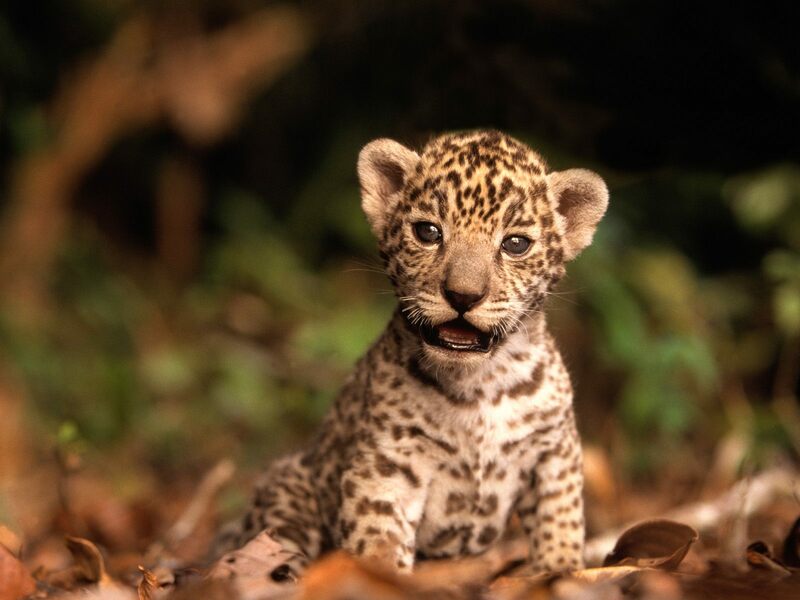 Although jaguar cubs are generally born between the months of December and March, it is not uncommon for jaguar cubs to be born throughout the year. Female jaguars typically give birth to two or three jaguar cubs. In mating season, the female jaguar will use loud vocal calls to attract a male jaguar into her territory. Once the jaguar cubs are born however, the female jaguar will not tolerate the male jaguar in her territory as the female jaguar becomes very protective of her cubs at this stage. Jaguar cubs are born blind and gain their sight after about two weeks. They are weaned by their mother when they are around 3 months old, although the cubs will rely on their mother to hunt and provide for them until they are about 6 months old. 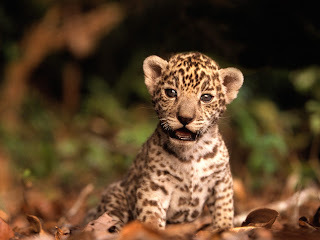 At 6 months, the jaguar cubs will then start to accompany the mother jaguar on hunts but will not venture out on their own until they are one or two years old and have established a territory for themselves. As with many other cat species, the jaguar is a solitary animal with the exception of the first couple of years that jaguar cubs spend with their mother. 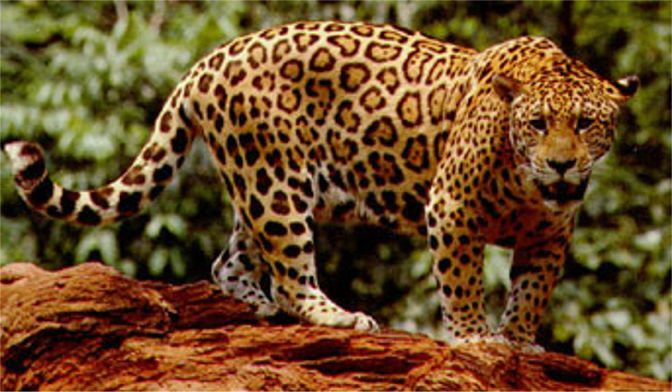 Jaguars are able to crossbreed with both leopards and lions. A lepjag was produced by the film industry to produce a cat that looks like a jaguar but is easier to handle like a leopard. He lives in retirement now in a big cat sanctuary. He has the massive body type of the jaguar but the rosetting pattern of a leopard. Like other male big cat hybrids he is sterile. A couple of years ago a black male jaguar mated with a female lion at Bear Creek Sanctuary in Canada. The result of this accidental pairing was two jaglion cubs. The male is light coloured like a lion with jaguar rosettes. The female is black with black rosettes (in jaguars the gene for black is a dominant gene, unlike in the leopard). Because the male was neutered, he will not grow a mane. But probably he would have if left intact.